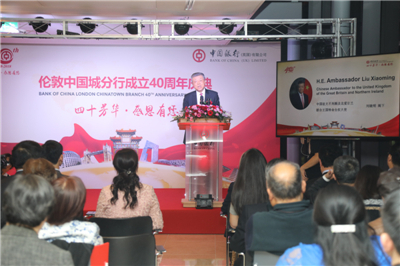 It is a real delight to join you to mark the 40th anniversary of the Bank of China London Chinatown Branch! Let begin by extending my warmest congratulations! 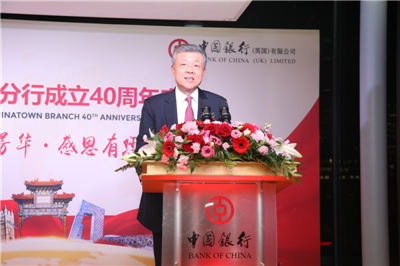 Forty years ago, as China embarked on the great journey of reform and opening up, the Bank of China officially launched the London Chinatown Branch. Forty years on, as China deepens reform and opens wider to the outside world, the Bank of China has branches all over the world. Such success epitomises the great achievements of China’s reform and opening up. After 40 years of intensive cultivation in the British market and assiduous service to the local community, Bank of China has become a welcome feature in the landscape of Chinatown. Hand-in-hand with its British partners, it has made considerable contribution to local prosperity and development. Today, we are celebrating the 40th anniversary of the London Chinatown Branch not only to review what has been achieved but also look ahead into the future. Looking into the future, I would like to share with you my three hopes for the Bank of China London Branch and the Chinatown Branch. First, I hope you will continue to be the leader in the internationalisation of China’s banking institutions. The Bank of China has always been a pioneer in this aspect. Your London Branch dates back to 1929. This was the first step in the internationalization of China’s modern financial sector. The steps had quickened as China’s banking sector continued to explore the global market. By the end of 2016, about 22 Chinese banks had set up 1,353 overseas branches in 63 countries and regions around the world. As of today, seven Chinese banks, including the top five state-owned commercial banks, have set up branches in London. Since the beginning of this year, the Chinese Government has announced a number of important measures of further opening up. These measures represent significant opportunities for Chinese banks and other financial institutions to expand their global business. I hope the Bank of China will build on its past achievements, explore new frontiers and aim at higher goals. I hope that you will improve the quality of the RMB’s global products and services, and continue to be the vanguard of China’s integration into the global banking industry. Second, I hope you will continue to be a promoter of China-UK financial cooperation. As China-UK relations continue to deepen, financial cooperation between our two countries has become deeper, more diversified and more intensive. In 2016, the Bank of China London Branch was entrusted by the Ministry of Finance of China to issue RMB sovereign bond. In the same year, the Bank of China listed the first Green Covered Bond at the London Stock Exchange. China also encourages the establishment of financial services platforms in countries along the Belt and Road. This will create more opportunities for enhancing the already flourishing China-UK cooperation on the Belt and Road Initiative. and to create more highlights in China-UK financial cooperation. Third, I hope you will continue to be a contributor to the economic and social progress of the local community. Very soon, the Bank of China will be celebrating the 90th anniversary of its London Branch. In the past nearly 90 years, the Bank of China has worked closely with all sectors here in the UK. You have built a good image as a reliable brand. The Chinatown Branch has been an active member of the London Chinatown community. Your active role in various events, including your sponsorship of the Chinese New Year celebrations at the Trafalgar Square over the years, have help bring Chinese culture to the door steps of the British people. It is my hope that both the London Branch and the Chinatown Branch of Bank of China will continue to focus on local business, improve local services and give back to the local community. I am sure that through such efforts, the Bank of China will present a fine image of China in the local community and enhance the friendship and cooperation between China and the UK. The logo of the Bank of China has the Chinese character “zhong” in it. Zhong means central. This logo embodies a profound message and high expectation. I sincerely hope that the Bank of China London Branch and the Chinatown Branch will continue to explore and increase its integration in the British market. I hope you will, as your logo signifies, become the “central force” driving China-UK financial cooperation, and become the “central pillar” supporting regional development and sub national exchanges between our two countries. Finally, I hope you will make new and greater contribution to the steady and sustained development of the China-UK “Golden Era”!